Lentiviral based constructs represent a recent development in the generation of transgenic animals. The ease of use, and the fact that the same backbone vectors can be used to down-modulate endogenous gene expression and to produce transgenic animals overexpressing a gene of interest, have fuelled growing interest in this technology. In this study, we have used a lentiviral delivery system to generate transgenic mice expressing altered levels (up or downregulated) of a gene of interest. Although this lentiviral-based approach led to high levels of transgenesis and germ line transmission, a wide variation in transgene expression was observed in most first and second generation mouse lines. 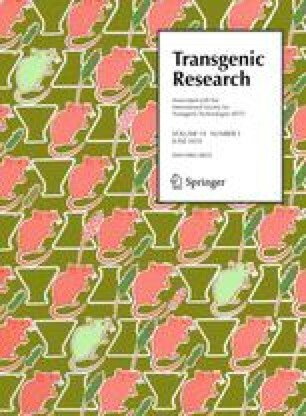 In particular, despite the segregation of integrants into single-copy expressing mouse lines, transgene expression appeared to be the target of epigenetic regulatory mechanism, often causing the coexistence of high and low transgene expressing cells within a given tissue such as blood peripheral lymphocytes. The establishment and analysis of large number of mouse lines may therefore be required to select a stable transgenic line with pancellular expression of a gene of interest using this lentiviral-based approach. The online version of this article (doi: 10.1007/s11248-009-9318-4) contains supplementary material, which is available to authorized users. We thank, M. Blockmans for providing lentiviral construct, T. Van Reeth for kind gift of the PGK-Cre expressing mouse strain. We also wish to thank Dr. D. Trono (University of Geneva, Switzerland) for providing the pWPXLd, psPAX2 and pMD2.G plasmids and Dr. SJ. Elledge (Harvard Medical School Boston, U.S.A.) for generously providing the pPRIME-CMV-GFP-FF3 vector. This work was supported by The Belgian Program in Interuniversity Poles of Attraction Initiated by the BelgianSate, Prime Minister’s office, Science Policy Programming, by a Research Concerted Action of the Communauté française de Belgique and by the “Région Wallonne” (Programme CIBLE), Belgium. DB, LF and EP were supported by a grant from “Fonds pour la formation à la Recherche dans l’Industrie et dans l’Agriculture, FRIA”, while SS and MM are supported by the “Fonds National de la Recherche Scientifique de Belgique, FRS-FNRS”. The scientific responsibility is assumed by the authors.